Crunk!!! is a pomegranate-flavored energy drink brand that is promoted in connection to the music of Atlanta-based hip-hop artist and producer Lil' Jon. Crunk!!! is independently distributed in eleven states. 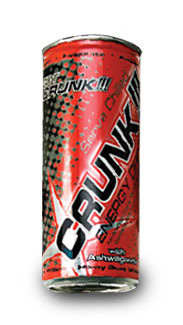 "Crunk" is the term popularized by Lil' Jon to describe a style of music that influences the youth and street scene of Atlanta and the entire south. Crunk is a bi-product of Hip-Hop and southern pride and resilience; letting loose, feeling free, and expressing yourself is crunk. Crunk!!! is formulated with a proprietary blend that includes caffeine, green tea leaf, licorice root, milk thistle and Horny Goat weed.